New York Skate News - "Local Orthodontist Promotes Safety on Wheels"
New York University College of Dentistry Explorer - "Dental Team and staff in Ghana"
Thank you for being so generous as to have allowed me to spend time observing you "in action" this afternoon at your office. Your vision of a home/office appears to be an unqualified success. I, for one, certainly was made to feel very much "at home" and I appreciated your hospitality. Everyone I had the opportunity to meet today was nice, friendly, helpful, and warm. Among other things, today I learned why your name has seemed particularly familiar to me. As an avid reader of The New York Times, I am sure that I spotted the article in which you were featured when it was first printed. You must feel honored that your accomplishments have been so recognized. Thank you for an excellent opportunity for me to broaden my educational experience today. I am very grateful to you, admire your talents, and hope to learn more from you in the future. Thanks for sending me the nice card for Christmas!!! Happy New Year!!!! I know I am late....You can't imagine how many times I said "tomorrow, I'll call Iris..." and...I have never called!!! I want you to know that I didn't forget you and especially what you have done for me. Really, Iris, almost every day in my office I say to myself that if I am able to work I have to thank you!!! You taught me everything I am doing, and I'll never forget this. Here in Bari, everything is fine; I am working and ... so far so good!!! I have almost 150 patients and I am trying to do my best. I am planning to go to Toronto and of course I'll stop a few days in New York. I'll let you know everything in advance. Are you going there?! Or I'll see you in N.Y.? I didn't ask how you are...I am terrible...How are you doing?! And the office? Cathy keeps saying that your office is always...number one!!! And I trust her!!! How about your free time? I'm so proud of you - it is a wonderful way to start the swim into the ocean of orthodontics. You will have no problem in staying afloat. I am happy to hear that you are keeping up with your education. I'm still learning - I guess you never stop the pursuit. Keep up the effort and success is sure to follow - you certainly have a bright future. You have also carried the banner high for NYU and this also is too recognized and applauded. Don't worry, I am not addicted to e-mail, but I do want to thank you for the talk we had the other day. It really matters to me that I fully understand all the issues relating to Katja's treatment, and our conversation helped to clarify the situation. I appreciate the time you took to discuss her little mouth with all its tribulations when you are surrounded daily by endless teeth, thrusting tongues, wayward jaws and less than palatial palates. It must be difficult to continually have to explain the same sorts of things to a never-ending sea of parents, but each time you do you can be assured that it is truly valued by the moms and dads. I wanted to take this opportunity to THANK YOU for the tremendous work you did on my teeth over the past 13 months. Now that I have my braces off, I can smile freely and with confidence. I'm so proud of my new smile that I've taken to carrying around my "before and after" photo to show to friends! I also wanted to thank you for your professionalism and encouragement during my orthodontic treatment. I shopped around before I met you, talking to 2-3 other orthodontists. Their care for and respect of patients was nowhere near what you have shown. It always impressed me, how you could switch gears in an instant; saying just the right thing to a nine-year-old, and in an instant, dealing with adult patients with courtesy and respect, and as a peer who is capable of understanding how the treatment works. It is a skill that all professionals (whether in medicine, law, or business) strive to master. I will continue to send friends of mine your way - I hope you don't mind! As for my own teeth, I'm continuing to work on the flossing and tongue thrust - want to keep that smile intact!! Wishing you all the best - and please send my regards to your wonderful staff. Thank you soooooooo much for all your hard work. My teeth really look amazing and I have gotten many compliments on them. People have even asked who my orthodontist was! Your talent, kindness and hard work I am so grateful for and made the sometimes painful experience of braces more enjoyable. Your hard work was greatly appreciated. Thank you so much for all the wonderful things you have done (not just to my teeth). PS - Thank you so much for the flosser!! Cha was sitting at dinner with her boyfriend at the time and a few other friends one evening when the revelation came. Her boyfriend, with all the best intentions, proclaimed to the group, "You know, Cha is so beautiful - she's nearly perfect...except for her teeth." Having known Iris since college, Cha went to her, explained her situation, and asked her advice. Dr. Vardy responded, "Cha, since you don't want to wear visible braces, I suggest we use lingual braces on you. Before you know it, your teeth and smile will be perfect." Dr. Vardy corrected Cha's teeth within a year and a half. "People ask me if these are my own teeth since they look so great! I never had anyone comment on my smile and teeth before!" Cha was amazed at how many compliments she received regarding her teeth. She had never thought it would make such a difference in her appearance. To this day, many years later, Dr. Vardy still gets phone calls from Cha, who is now living in Los Angeles, saying people stop her to compliment her teeth. This photo, taken from Cha's wedding day show off just how much a nice smile can affect your looks. They saw it, got engaged and married there, then bought it. They met at Club Getaway. They became engaged on the stoop of the house they dreamed of buying. They got married in the front parlor of the house - four months before they bought it. "You see, there was my best friend, and her guy was Marc's best friend growing up," said Dr. Iris Vardy Strauss, a very athletic orthodontist. "At one point, I'd actually been on the Getaway staff - you know, it's that 'weekend camp for adults' up in Connecticut - teaching mountain climbing and rollerblading. But one weekend, Memorial Day weekend last year, I was there as just a guest." "We met on a Friday," said Marc Strauss, a very athletic wholesale food distributor. "I followed her to the tennis courts on Saturday. We'd actually met once before - I remember thinking she was a very sweet girl." "They say you're in the presence of the right people all the time," said Dr. Vardy Strauss, a petite 32-year-old woman with very long blonde hair. "You just have to find the right time." "Gee, that's really good - I've never heard that before," said Mr. Strauss, 33, sidling up to his new bride and patting her arm. So they met at the singles camp, and by the second day, Mr. Strauss said, he was in love. "We spent all day playing sports," he said. "We found we were big athletes. Now we rollerblade all over Manhattan; we wear mirrors on our wrists." One day when they were rollerblading around, almost 20 blocks from where Dr. Vardy Strauss had her office, at Central Park West and 97th Street, they shot past West 78th Street and stopped. They saw the tree-lined block between Amsterdam and Columbus, right near the American Museum of Natural History. They saw P.S. 87, one of the best public schools in the city. And most important, they saw the house at 130 West 78th Street - the one with the For Sale sign on it. "So I memorized the telephone number, and then we called, and finally, we bopped over to the real estate office," said Dr. Vardy Strauss. "I'm an orthodontist and you want the best place. You want to be on West 78th Street because of the school, the tree-lined block; most homes here are individually owned, just like a suburban block." "It's not because of Iris's orthodontics business that we like the school so much," Mr. Strauss added. "It's because we want to have children, and it'd be tremendous to come in and see Mommy after school." When she found out the asking price of the house - $975,000 - Dr. Vardy Strauss said, she winced. That night, she said to Mr. Strauss - she'd now known him two weeks - "Can I tell you my dream? I'd like to have that house and have my practice on the ground floor. "And he said: 'Then my dream is to buy it for you,'" she continued, beaming. After that, things heated up even more. Although he was living in Englewood, N.J., and working in the Bronx, Mr. Strauss bought a full year's membership at the Equinox Health Club at 77th Street and Amsterdam, right near 78th Street house. "I'm a gym rat and I knew I'd be spending a lot of time around here," he said. They finally made an appointment to see the inside of the house on Oct. 20. They had an accepted offer for $850,000 on Nov. 2. Two days later, on the stoop, he asked her to marry him. "Iris's practice has grown to the point where she needed more space," he said, sounding like a business manager. "She only has one chair where she was and she's going to have four chairs." The couple were very tough negotiators, according to Dexter Guerrieri, who owns Vandenberg Real Estate, the company with the listing on the four-story brownstone. "Typically, people who want to buy a house have the engineers in, maybe the architects - these people had florists come in, the caterers. Here they were at the contract signing. They'd agreed on the price, and then they spent hours hammering out the agreement to be married in the front parlor" before the sale was completed. "The lawyers kept saying: 'What's the big deal - it's just a minor point,'" Mr. Strauss said. "But we had to let him know it was not a minor point to us." In the end, the problem came down to insurance. The couple wanted more than 100 people in the house for the New Year's Day wedding, and wanted use of the house for rehearsals for several days before. "We ended up with their buying insurance for the year - it was about a third the price of buying insurance for one day," said Mr. Guerrieri. It was good they went ahead and got married. Because the building's certificate of occupancy had vanished from the Department of Buildings' files, the actual closing did not take place until four months later, on May 1. In the meantime, the couple went on rollerblading up and down the streets around the house, meeting, they say, the most interesting people. They met the man destined to become their architect, who was working on his own house on the same block, and they promptly invited him to the wedding. Then it turned out that an old friend of Dr. Vardy Strauss's, an artist known professionally as Linus, had done the mural on the front of P.S. 87 - and he promised to do another mural on the ceiling of her clinic. "I mean there's so much good energy here," she said. Now that they've bought the house, they're going to start fixing it up, and Dr. Vardy Strauss is adamant: Whoever is chosen as contractor, they will start next week - and be out in a month. Following her plans, the whole ground floor is to be an orthodontics office, with a video camera and a buzzer out front, "for the kids' safety," she said. The apartment the real estate agents called the "owners' duplex" takes up the first floor and half of the second. They will rent that out now "because we need to pay the mortgage," she said. The second-floor studio will be rented out, and there are currently two rent-stabilized tenants living in studios on the fourth floors. That leaves the two studios on the third floor for the Strausses, who will combine the two to make a spacious one-bedroom apartment with a small but scenic deck off their bedroom in back. The house is perfect, they say. "Once we got engaged on the stoop and married in the parlor, we knew we'd have to have it," he said. "Besides," she said, with a shake of her very long hair, "if we hadn't bought it, there'd be no story." In February 1993, Ron Lorber died in a tragic midair collision. He had practiced orthodontics in Atlanta for more than 20 years. He was a close personal friend of Chaz Cone, the president of Orthodontic Practice Management System (OPMS), and, in fact, was the orthodontist who inspired Chaz to write the software program that is now used in many orthodontic offices throughout the United States and Canada. In Dr. Lorber's memory, OPMS has set up an annual award to be given to a graduating orthodontist to help him or her get started. The first annual Ron Lorber Achievement Award was presented on Nov. 5, 1993, in Atlanta to Iris Vardy, a 1993 orthodontic graduate of New York University College of Dentistry. Dr. Vardy was chosen by a committee of orthodontists who believed she best exemplified the spirit of achievement that Dr. Lorber demonstrated in his life. Dr. Vardy, despite the fact that she just graduated, has already donated her time and expertise to an organization called "Dentists For The World" where she is helping to open a dental clinic for orphan children in Da Nung, Vietnam. While in her third year of dental school, she travelled at her own expense to West Africa, Honduras, and France to provide dental care for underprivileged children. During her postdoctoral training in orthodontics at NYU, which was very patient oriented, she asked that her curriculum be altered to include an externship at the Institute of Reconstructive Plastic Surgery located in the NYU Medical Center. Of this special training she says, "There I learned about how to treat patients who are born with terrible facial disfigurements. I always come out of there feeling so elated. These children are incredible. By virtue of their deformity, most are scarred and traumatized. Despite being dealt this hand, many of these kids still manage to put on a happy face in their outlook on life. This is an inspiration to me." Dr. Vardy currently donates some of her professional life to attending cleft palate conferences that meet both at NYU and at Columbia University, so that she may continue to learn to treat such problems. In addition to all this, Dr. Vardy is local treasurer of the American Association of Women Dentists, as well as the 1991 winner of the ADA Certificate of Recognition through Council on ADA Sessions and International Relations for her service to people of Honduras and Ghana in sharing the benefits of American dentistry. With the Ron Lorber Achievement Award, Dr. Vardy received the OPMS practice management software, the computer equipment on which to use it, all needed training, and a portable cellular telephone. The value of this award exceeds $15,000. Any 1994 graduate of an accredited orthodontic program in the United States may apply for the 1994 award. Interested persons should contact Jamie Phillips at 1-800-334-4608 for details. Congratulations on your acceptance to the Harvard School of Dental Medicine. We expect to hear from you shortly regarding your decision to accept the place offered to you in the Class of 1991. The Office of Student Affairs looks forward to working closely with you in the years to come, and we would like to provide you with some information about financial aid and student housing in order to help you make your plans for the future. All loans, scholarships, and work/study funds administered by the Dental School are awarded strictly on the basis of need. Each applicant for financial aid must submit a Graduate and Professional Schools Financial Aid Service (GAPSFAS) application, which must be accompanied by a Parents' Questionnaire. An application and Parents' Questionnaire are enclosed for your convenience. In addition to the GAPSFAS application, a copy of the parental IRS 1040 form for Calendar Year 1985 must be filed with the Student Affairs Office for all students requesting aid. Following processing of the GAPSFAS application and receipt of the required documents, the Committee on Financial Aid will consider your request for financial assistance. Written notification of your financial aid award will be sent to you prior to the date of registration at HSDM. Please note that our funds are extremely limited, and while every effort is made to assist our students, it is not possible for us to provide School-administered aid up to the anticipated level of the student budget. Students should plan to pursue outside sources of funding to supplement personal and family resources and aid awarded through the Dental School. Our Financial Aid Bulletin, which includes detailed information about our policies and procedures, is being revised, pending changes in the federal financial assistance programs, and will be sent to you as soon as it is published. If you accept our offer of a place at HSDM, please submit the enclosed Preliminary Application for Financial Aid. This form may be returned with your response to the Admissions Office. If you do not plan to apply for financial aid, you may indicate this fact on the form. You are not bound by such a statement, as we realize that situations may change in the next several months. It will, however, help us to project the most efficient utilization of our funds. We are delighted to receive this gift of $335.00 on behalf of the Department of Education. We especially appreciate your offer to donate your consulting fees and expenses following the very special program, "Evi-dents" for the children's workshops. These funds will be allocated to helping children take part in future workshop programs through scholarships offered by the American Museum of Natural History. Thank you for considering these programs. They are some of the best in the nation and we appreciate your generous consideration. Thank you very much for your interest in sport of luge and many thanks for your generous offer to assist our National Luge Team athletes in Lillehammer and back home in Lake Placid, NY. Members of our National Luge Team are looking forward to working with you. As you know during training and competitions our luge athletes sometimes experience dental and orthodontic discomfort. This discomfort can be very painful and affect the performance of our athletes. I hope that with your research and actual clinical help, we can overcome these problems. In the near future I will invite you to one of our summer luge camps where you can examine all of our athletes. I will appreciate all of your recommendations. Thank you very much for your interest and help. The Chancellor's Service Awards for Volunteerism and Community Service are presented to student organizations and individuals for their extraordinary efforts to sponsor activities and projects in support of humanitarian causes at the university and in the greater community. For coordinating Kriser Dental School's student/facility "Ghana Program" which brings dental care to under-served populations in Ghana and other developing countries. I wish to express my heartiest congratulations to you on receiving the 1991 Chancellor's Service Award for Volunteerism and Community Service. This is a singular honor of which you can be justifiably proud. I take pride in the fact that your accomplishments enhance the reputation of the College of Dentistry. It is students of your caliber who make my affiliation with the College so deeply rewarding and who I am sure will continue to serve the community and the dental profession with distinction in the years ahead. Congratulations again on this splendid achievement and best wishes for your future success and contentment. 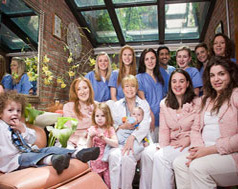 "I joined organized dentistry seeking advice/guidance from my colleagues who have built private practices in Manhattan. I felt that I needed to learn the day-to-day workings of the dental business. Organized dentistry provides a gathering of colleagues with experience along with a desire to improve upon that experience and to share." Full-time private practice limited to orthodontics. Owns building in which practice is located. New York County representative to DSSNY Council on New Dentist. Chair Eastern Dental Society Centennial/Scientific Program. Treasurer American Association Women Dentists (Manhattan Chapter), Host Alpha Omega Dental Study Clubs. Teaches and runs annual children's workshop at Museum Natural History, Manhattan; donates salary to further museum programs for children. Married. Enjoys snowboarding, bump skiing, rollerblading, yoga, interior decorating, gardening, tennis, mountain biking, collecting original art. Hopes to become integral part of community by volunteering time in neighborhood activities, and to raise a family in the same building in which she practices. The Neighborhood Gazette is proud to announce that Dr. Iris Vardy, an Orthodontist, will be joining us as a columnist starting in August. Dr. Vardy has a practice on Central Park West. Dr. Vardy on a recent trip to Israel where she volunteered in a Dental Clinic for underprivileged children. Dr. Vardy said, "Considering the recent political changes in their hopes for peace with the Palestinians and the surrounding Arab countries, I was happy to know that we were treating both Jewish and non-Jewish children at the clinic." I started in-line skating three years ago as a means of transportation to and from my residency in orthodontics at NYU and now I'm hooked. 'Blading is a blast and 'blading through the streets of Manhattan is like having an obstacle course right outside your door. However, it's definitely a dangerous game. I bought my first helmet only after 2 1/2 years of being very lucky. Then, as luck would have it, two weeks later, while in Central Park training for my first race. I had a serious fall. Speeding in a tuck down a hill, my wheels started to wobble. Even though I was on my brand new Macroblade Equipe's, I was going too fast for four wheels. I fell - hands, knees, and face first. If it weren't for my wrist guards and helmet, which the fall took a big chunk out of... well... I don't know. At the emergency room at Mt. Sinai Hospital, I requested an X-ray of my jaw. I had knocked my chin so hard, that I was worried I had injured my TMJ joint. Being an orthodontist, I've seen countless patients who had trauma to that joint and then suffered pain. I was terrified. A traumatic injury to one side of the jaw can knock it to the opposing side. If the jaw heals in this asymmetric fashion, with unbalanced pressure to the joints, this can then transfer to pain and problems opening the closing the mouth. As a result of my experience, I've started constructing mouthguards for athletes. A mouthguard not only protects the teeth, but also protects the TMJ, by serving as a shock absorber. Since comfort is important, because in order for the mouthguard to be effective, it must be worn (obviously), mouthguards should be custom made. The mouthguards may be used as bleaching trays, but that depends on the individual and the status of his/her oral health. When the NYRSA asked, I happily agreed to allow NYRSA members special privileges in support of "safety on wheels." For more information, please call: (212) 663-2269. SKATE SAFE! The following is a self explanatory thank-you letter for a job well done. On behalf of the Bishop of Keta-Ho Diocese, Rt. Rev. Francis A.K. Lodonu, the Diocesan Health Committee, the dental patients, the hospital authorities, and on my own behalf, I wish to express my sincerest gratitude to you and the team of dentists which came to work in the Diocese. Their services cannot be underestimated and their contribution was of such an invaluable character that time and events can never erode it from our minds. History has been made in the health department of the Diocese, never to be forgotten. We shall forever cherish the good gesture and the services rendered by all the members of the team. I will not be exaggerating if I say that patients were in tears to hear that the team was leaving and since their departure, I have had visits and letters from people with dental problems wanting to know when there will be such a team again. I wish to thank you very sincerely for your efforts and concern. I want to assure you that your efforts have not been in vain but are highly appreciated. I don't think I will be asking too much if I request that the programme be continued and on a regular basis. The members of the team have an idea now of what the situation is as far as dental health is concerned is this part of the country and even what the climatic conditions are. Turning on the members of the team, I would say that the team on the whole was simply wonderful, terrific. The team was indeed a team which was together and worked as such. I had a lot to learn from them as far as teamwork is concerned. Looking at them individually, I would say that they are simple, dedicated, loving, caring and very concerned. They worked hard and were very supportive of one another. Their devotion was in no mean measure and if we mean to quantify their services, I would beg the amount at US $100,000,000. The two weeks they spent with us would never be forgotten, and like Oliver Twist, we are asking for more. There were however certain unpleasant circumstances which I am happy were resolved before they left. Messages were misunderstood and misrepresented and that caused them certain inconveniences. However since we all stand to be corrected, we have learned from our faults and hope that such errors will not be repeated again. As I have said earlier, I would like to request that the programme continue and on a regular basis. We urgently need such services. My regards to all the members of the team Sheley Kupper, Aric Kupper, Karen Nichols, Phyllis Ho, Linda Stern and Iris Vardy. Tell them "Bravo" and that we are itching to see them again. On behalf of the students, teachers and administrative staff here at Beth Jacob-Beth Miriam, I wish to express my sincere gratitude and appreciation to you for visiting our school. The children definitely learned the importance of good dental hygiene practices, and how to acquire them. You had a special knack to keep the children interested by using them as model teeth. The program was a wonderful success. I am looking forward to seeing you again. Renewed thanks for coming to us with your great presentation.